The Hasso Plattner Institute of Design Thinking at UCT launchesd its design thinking foundation course on Monday 6 March at the institute’s colourful headquarters at UCT Business School’s Breakwater Campus on Portswood Road in Greenpoint. The semester long courses take place twice a year, two days a week. Design thinking is a methodology originally developed by industrial designers in the 1960’s that enables innovation and new outcomes in all fields of human endeavor from tackling poverty to improving government services to developing new human centered products and services for business. When implemented in daily life and professional work, the design thinking tools, process and mindset with which students leave the training, help them to develop a creative approach to problem solving and to contribute to a culture of innovation. The d-school was founded in Cape Town in August 2015 with funding and academic support from Professor Dr Hasso Plattner-co founder of global business software company SAP AG and officially launched at the Graduate School of Business Breakwater campus on March 9 this year. Professor Plattner initiated and funded the first academic programmes in design thinking at Stanford University in the USA in 2005 and at Potsdam in Germany in 2009. This brought academic rigour to design-led innovation practice . 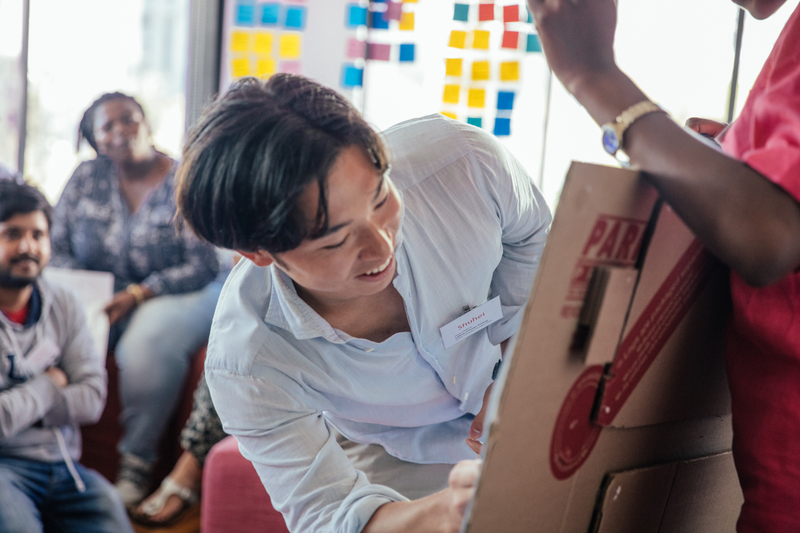 Last year the UCT d-school piloted the first academic programme of its kind in Africa with a group of pioneering students who learnt how to creatively confront real world challenges posed by project partners from the corporate, public and start-up sectors. UCT’s d-school, as it is commonly referred to, is the only academic institution on the continent which offers academic training and capacitation in design thinking to university postgraduate students and the private sector. This year’s group of foundation students come from a diverse array of countries and backgrounds, ranging in age from 28 years old to 47 years old from South Africa, the Congo, Italy, Portugal, Botswana, Uganda, Zimbabwe, Camaroon, Spain, Egypt and Ghana. Their academic disciplines are even more diverse traversing Educational Technology, City Planning, Law, Social Policy, Economic History, Digital Forensics, Politics, Health, Geomatics, Neuroscience, Architecture, Geology, Geography, Journalism, Business Sport, Chemical Engineering, History and Marketing. Dr Rael Futerman, programme manager in charge of the foundation course says this diversity of cultural and disciplinary backgrounds at the South African d-school distinguishes it from its sister schools in Stanford and Potsdam and makes for rich collaboration which is of great benefit to project partners and students. For Dr Keneilwe Munyai, the programme manager in charge of the advanced programme in design thinking, the highlight of the course is observing the transformation from when students arrive in the programme to when they leave.